NEW! The Budget Roll-Up Banner range is our most economical to date. Low cost, lightweight and available in four in stock sizes. All prices are based on a single artwork and digital print. If you need more than 1 artwork, please add these separately. We also offer a screen print service - please call or email for more information. Varnish is a printing process which protects the printed design from scratches and damage, therefore prolonging its life. It also gives the design a glossy shine. All aluminium parts, foot and end caps. Description All your Budget Roll-Up Banner will be sent as individual units by parcel delivery. Your Budget Roll-Up Banner will be sent in two separate deliveries – one by pallet, one by parcel. Quick and easy to use. Soft round corners - no sharp edges. Available in 600, 800, 850 and 1000mm wide banners. Top ‘clamp rail’ and bottom adhesive strip makes banner installation and update a simple process. Silver anodised aluminium case with black fittings, top rail, pole and black centralised folding nylon foot and nylon end caps. Complete with lightweight black carry case and full instructions. Available with digitally printed ‘standard’ 220 micron (0.22mm) rigid PVC or ‘premium’ 165 micron*(0.165mm) polyester film banners. Available in cartons of 6 for the best possible price and also individually. Optional Budget Banner Connectors available, enabling two banners to be displayed back to back. *600mm & 800mm Premium Banners whilst stocks last. Signwaves design, manufacture and print a huge range of point of sale signs and displays from kerb to counter... and beyond! 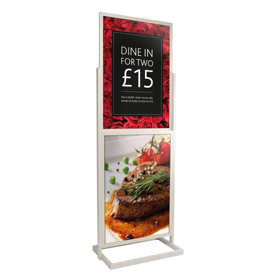 Whether you’re a sign company, marketing agency or brand; Signwaves has the perfect signs and displays for guaranteed footfall and converted sales.